Hope everyone had a lovely Christmas time, filled with happy days and maybe some lovely gifts. First I would like to share a picture of some inkle weaving that I couldn't put on the blog before Christmas otherwise the recipient, my husband, would see a sneaky peek. New to actually using my inkle loom I wanted to run ahead and learn to do lettering on it and produce a personalised strap for his ukelele and his ukelele case. 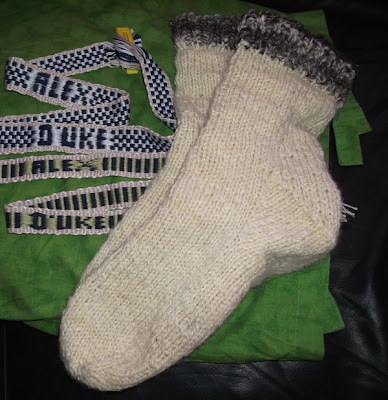 Here they are with his socks. 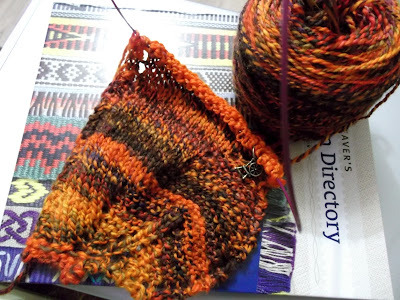 I'm really pleased with the results, need to work on those edges a bit but looking forward to more inkle weaving. 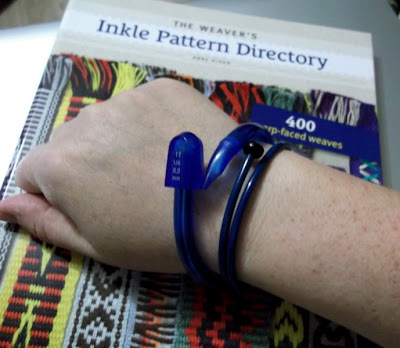 I had a lovely book on Inkle weaving patterns for Christmas so watch this space for more. My new book and lovely bangles too! 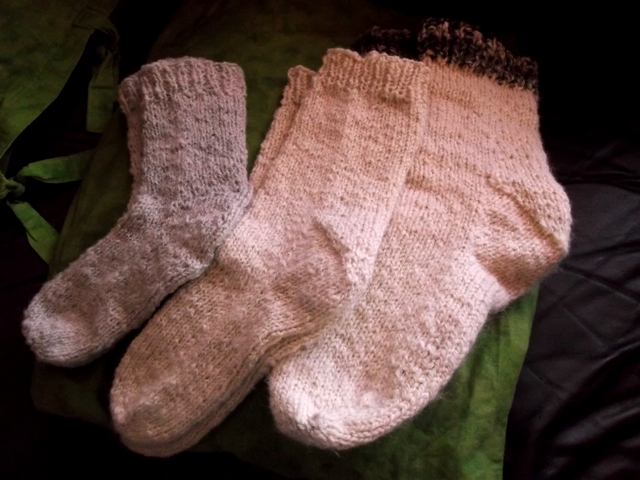 Socks were knitted aplenty in December and all three of us had a pair of handspun socks from the same fleece prepped from raw fleece under the tree. 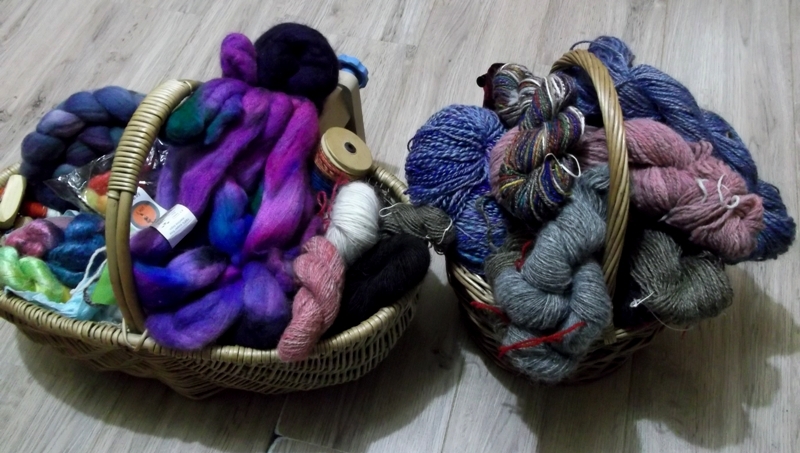 This was spun a few years ago and had sat as skeins for long enough. We are all very pleased with our house socks. So Christmas Day afternoon I could wait no longer to cast on the Autumn handspun - remember this in my December post? 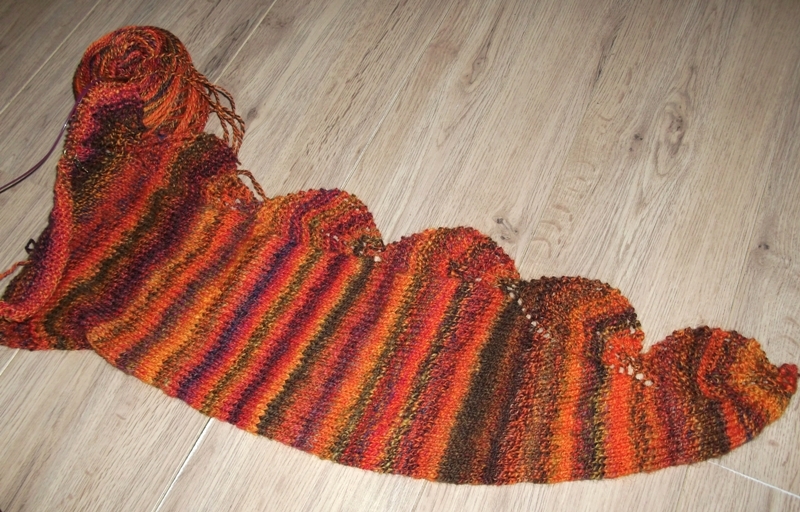 I decided on the Garden View Shawlette pattern on ravelry, with plenty of yardage to knit it and extend it. Here it is just a few days later, I would imagine it will be finished and blocked and being worn by the next Woolly Wednesday. 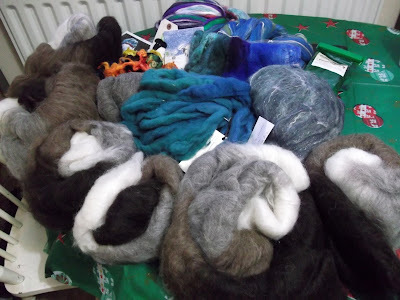 On the spinning wheel is this still, which I have done a little more of since Christmas. 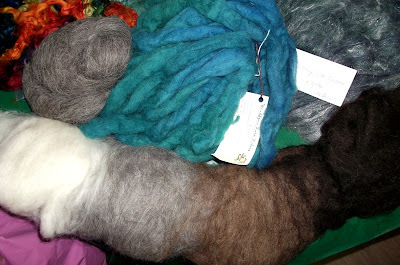 I want to finish spinning this fibre before starting something new, which is unbelievably hard when you see below what I received in a ravelry group secret santa swap. In the swap my swap gift was being sent late due to family illness so the organiser arranged some angels to send me some gifts. 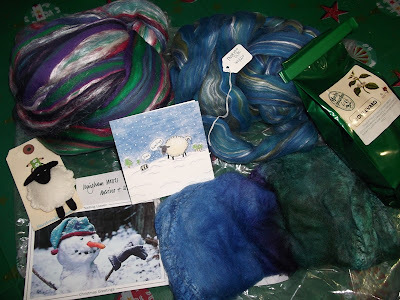 I received so many wonderful packages from my secret santa and a few angels. I was overwhelmed and delighted by these gifts, I shall put my name forward as an angel next year to pay-it-forward. One that made me smile so much was a keyring of a sheep that was bought from a very lovely blog friend - Shell at Handmade Haven - maker of delightful felt creations, and supplier of lovely felt. Take a look at all these lovely fibres waiting to spin, I gotta get a move on with this black alpaca mix so I can get spinning some of this. Looking forward to seeing everyone else's blog posts, seeing what everyone has planned for the year. 2013 for me ... I don't really do resolutions but aim to spin more, knit more, knit more from handspun to work may way through these lovely yarns I have spun - some in these baskets with other fibres waiting to be spun, and others stashed away elsewhere. 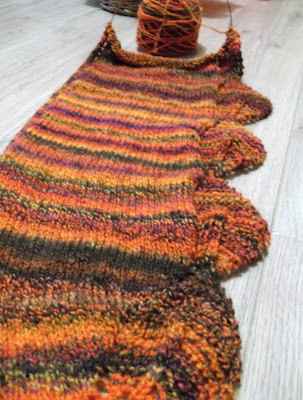 I have plans, many plans ... including more socks!